Imagine you’re designing a story-rich game. Over sixty thousand lines of dialogue. Hundreds of characters—all with distinctive voices, quirks, maybe even different languages. You’re soon faced with a choice. It’s often a trade-off. But what if you didn’t need to decide? 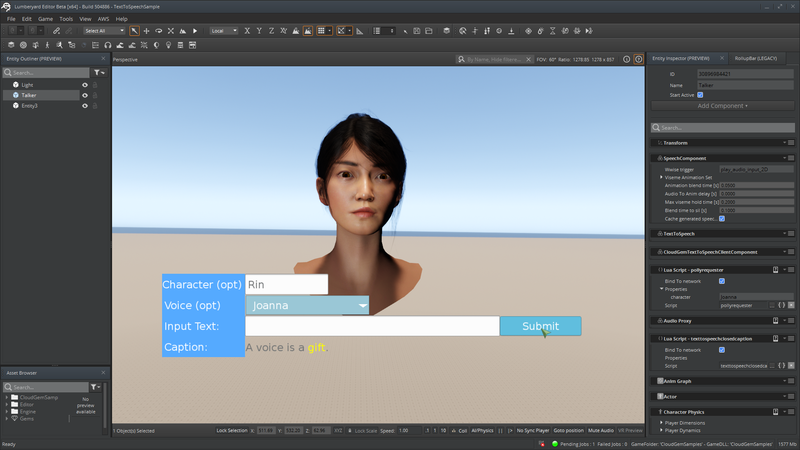 The Text to Speech Gem is available now with Lumberyard Beta 1.11. Download it here. 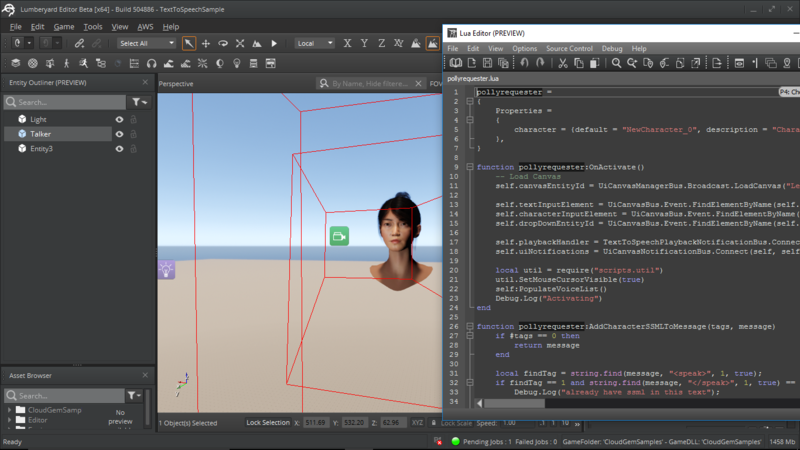 Lumberyard’s deep integration with AWS offers several advantages to game developers. For one, it helps you work faster by tapping into the vast compute power of the cloud. And two, it helps you create new, differentiated experiences for your players—regardless of your studio size. The Text to Speech Gem offers both advantages. Leveraging the deep learning technologies of Amazon Polly, the Text to Speech Gem gives you a quick and frictionless way to generate lifelike speech in your games, with support for 24 different languages and 50 unique voices. Consider some of the possibilities: create hours of voiced dialogue with a simple spreadsheet, generate lip-sync and closed caption data in a matter of seconds, and reduce the overall iteration time and spend for pre-production. With this Gem, you’re effectively your own speech production studio—and it all comes packaged with Lumberyard 1.11. Can’t afford to professionally voice 1000s of NPCs? Maybe you can use Amazon Polly for all those cyborg soldiers. But that doesn’t mean the Text to Speech Gem is designed to replace voice talent; it just makes your use of voice talent more efficient. It’s a common problem: you hire voice actors, you record dialogue, but then a part of the game was cut and you need to change some of that dialogue, thus requiring you bring the actor back in. Using Text to Speech means you can delay that voice work until the last minute—maximizing your time in the booth and reducing costly churn. We’ve also introduced a suite of cloud-assisted production tools to help you generate, package, and stage your in-game speech content. Located in Cloud Gem Portal, the Text to Speech Gem widget lets you fine tune details like visemes, custom pronunciation, and even word breaks. This means you can get the performance you’re looking for faster by providing actors with exact examples of how you want their lines delivered. Cloud-assisted production tools in the Cloud Gem Portal. Like other Lumberyard Cloud Gems, the Text to Speech Gem integrates AWS functionality via the Cloud Gem Framework. You can enable the Gem in the Project Configurator and deploy the resources to an AWS account by using the Cloud Canvas Resource Manager. If you’re just getting started with Cloud Gems, be sure to check out how to set up and access the Gem Portal here. More detailed documentation on using the Text to Speech Gem can be found here. For a closer look at how the Text to Speech Gem works, be sure to check out the TextToSpeechSample level in our CloudGemsSample project, which is already included in 1.11. There you’ll find the “Talker entity” built with the components needed to access the run-time speech generation, including text, character, and voice inputs. There are also sample Lua scripts attached to the entity that demonstrate generating requests from in-game and displaying closed caption. Head over to the forums for even more info. With 24 languages and 50 unique voices at your disposal, how will you use the Text to Speech Gem in your game? We’re excited to keep working with Amazon Polly to build out a more robust toolset for game developers. 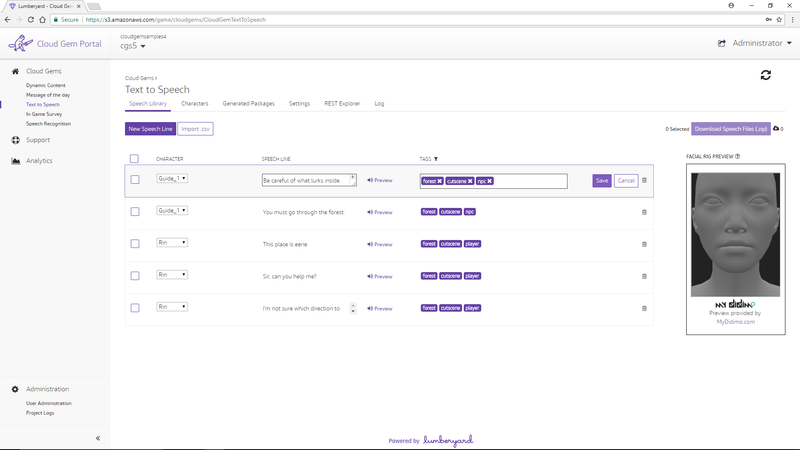 Be on the lookout in future Lumberyard releases as we continue build out this workflow, like making it even easier to replace synthesized speech with voice actor dialogue. To download the latest version of Lumberyard, visit our downloads page. Mark Biales has been on several teams in Amazon and is now the product manager for Lumberyard Cloud Canvas. He is interested in ways to use AWS to solve developer pain points and how new technology can create more immersive and enjoyable gaming.